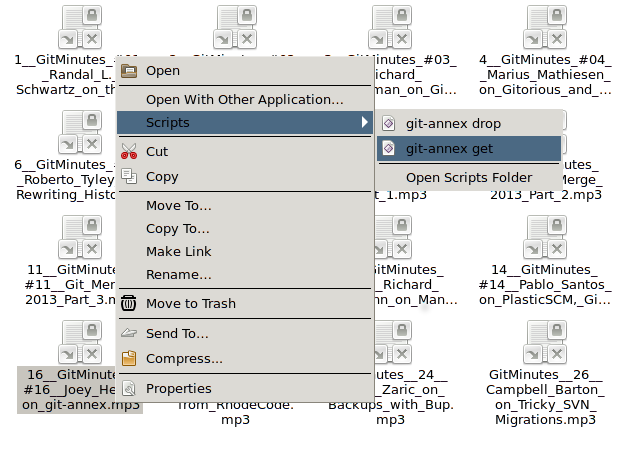 Integrating git-annex and your file manager provides an easy way to select annexed files to get or drop. The file manager can also be used to undo changes to file managed by git-annex. 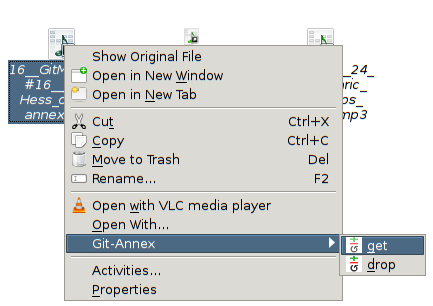 Recent git-annex comes with built-in integration for Nautilus. This is set up by git-annex creating simple scripts in ~/.local/share/nautilus/scripts, with names like "git-annex get"
Even more recent git-annex comes with built-in integration with Konqueror. This is set up by git-annex creating a $XDG_DATA_HOME/kservices5/ServiceMenus/git-annex.desktop file. The complete instructions on how to setup actions is in the Xfce documentation. Download and install the git-annex-turtle app (beta software). Provides Finder integration, badges and context menus. For OS X, it is possible to get context menus in Finder. Due to how OS X deals with symlinks, one needs to operate on folders if using indirect mode. Direct mode operation has not been tested. Open Automator and create a new Service. Using the Drop down menus in the top create the sentence "Service receives selected folders in Finder.app" to have it work on folders. For direct mode operation it is probably reasonable to select "files or folders". cd "$(dirname "$f")" && git-annex get "$f"
The purpose of the first line is there to get git-annex on to the path. The reason for the for loop is in case multiple files or folders are marked when running the context menu command. Finally save the the workflow under the name for which it should be listed in the context menu. Edit this page and add instructions! git-annex get --notify-start --notify-finish -- "$@"
The --notify-start and --notify-stop options make git-annex display a desktop notification. This is useful to give the user an indication that their action took effect. Desktop notifications are currently only implemented for Linux. For some reason I do not manage to get the shell script to pretty print. I can also supply a screenshot of the Automator, but do not manage to upload it to the wiki. @Carl, I've fixed the formatting. To add a picture, you'd need to send me a pull request adding it to the git repo.